Some thoughts, not necessarily happy. Pan is director Joe Wright and writer Jason Fuchs’ attempt at an origin story for J.M.Barrie’s Peter Pan story, and I’m not quite sure how I feel about it. We’re introduced to Peter being abandoned in front of an orphanage run by cranky nuns; so far so good. Suddenly orphans being sold to pirates? The movie jumps from slightly cheeky orphan movie to bizarre as air raid sirens sound, and a flying pirate ship is assumed to be Luftwaffe by the RAF. The pirate ship makes its escape to Neverland, where Peter and the orphans are greeted by a rousing chorus of Nirvana’s “Smells like Teen Spirit” sung by an assorted bunch of orphans, pirates, and miners. Here we learn that the pirate Blackbeard has been press-ganging orphans and others to help him mine for fairy dust, as he drove all the fairies to extinction years ago in his pursuit of this magical substance; it is also here that we learn of Peter’s destiny as a chosen one, to overthrow Blackbeard’s rule and avenge the fairies as their rightful prince. Overall, it isn’t a bad concept. I generally don’t like retcons to established concepts, but at least it’s an entertaining take and great for the kids. The movie goes so far as to introduce James Hook as one of the pressganged miners, with a little wink-wink-nudge as we see him wield a hook as one of his tools down in the fairy dust mines. The anachronistic music trick was funny when I saw it in A Knight’s Tale, but here, just feels forced as all hell. Again, lots of winks to the established Peter Pan stories, both visually and in the dialogue, but nothing really feels like it ties into Barrie’s Peter Pan. The movie does have its fun parts; some goofy one-liners by Hook, the action scenes, and some interesting costume designs, but overall ends up falling flat. Not a bad attempt, but when it comes to alternative Peter Pan stories, I think Robin Williams’ Hook is still way better than this. 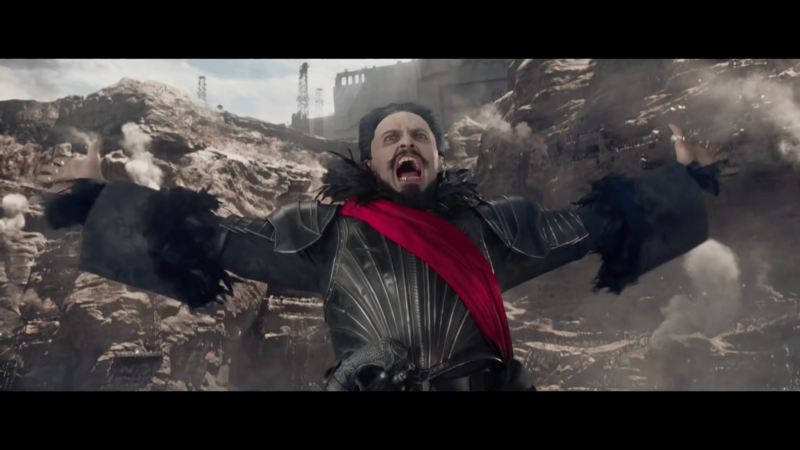 On the flipside, I found Hugh Jackman as Blackbeard to be hilarious. Pan will be released in Philippine cinemas Oct.8, 2015.